The testing of dynamic range and flare requires a proper test chart and environmental setup to get accurate results.High precision and high-density chart technologies such as photographic film or chrome on glass come with the disadvantage of glossiness which makes them susceptible to specular reflections on the target. This affects the use of dynamic range or contrast resolution and backlit flare targets that lack anti-reflective patches. 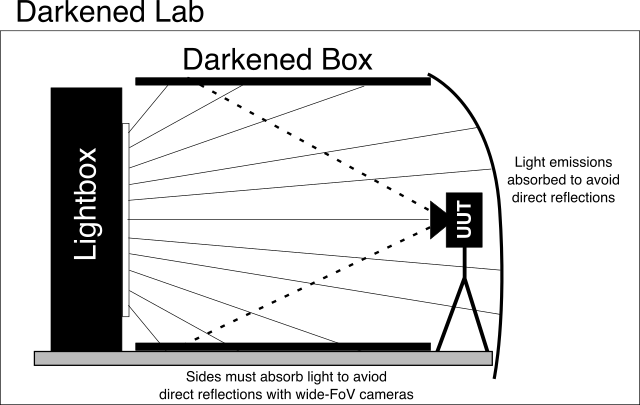 The goal of the backlit test setup is to maximize the fraction of light that is coming directly from your light source, through your test target, and into your lens, Any additional light that is present in your system can disrupt your measurements either by causing reflections on the analysis patch of your target, or otherwise introducing additional flare (veiling glare) into the image. 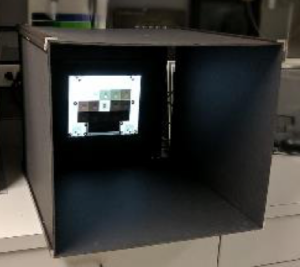 As the optimal lens and camera body housing will be manufactured with anti-reflective coating, it is good to take a similar approach with your test environment. Nothing is actually entirely black, but dark, opaque materials come in many different forms. These can be characterized by their total hemispherical reflectance (THR). The more that the surfaces in your test environment are lit up, the more they will become reflections in the glossy chart. 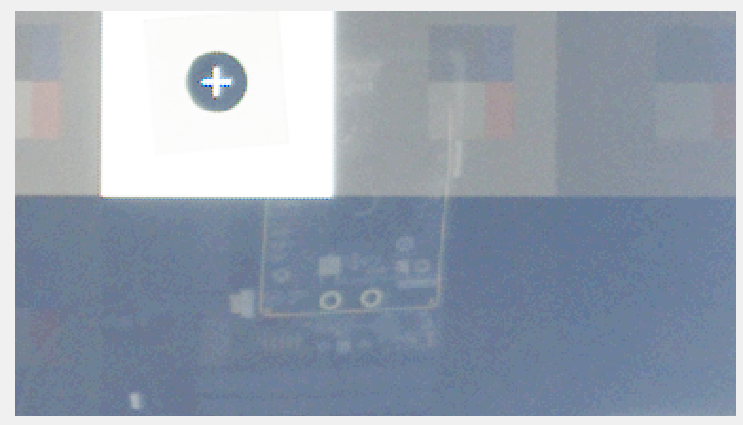 The body of the camera under test or even just glass of a camera lens can reflect back onto a test chart.This is especially important incident towards dark analysis regions. Reflective camera parts should be blocked by black masks. The entire area behind your camera will directly be reflected back, so this environment should be made as dark as possible. Sensor development kits often have blinking LED’s that reflect directly, Front facing cameras with displays that are not disabled or blocked off can be particularly problematic.